In terms of securing a long, useful life for your bicycle, inside storage is the best choice. However, between roommates, futons, and the many other necessities of life that take up space, sometimes bikes just have to live outside. Outdoor bikes can have a decent and valuable life, just like their luckier bike-peers that stay inside. Here, we present your guide to getting the most out of your outdoor bike without becoming obsessive or needing to minor in bicycle mechanic skills. While it might seem like neglected bicycles start to break down due to their depressed mood, it turns out that regular use really is the best way to prevent rusting and rotting bike parts. Using your bike breaks up newly formed rust before it can take hold, redistributes lubricants, and makes it a happy bike. The best defense is a good offense, and being proactive in the war on rust is the key to having a functional bicycle when you need it. 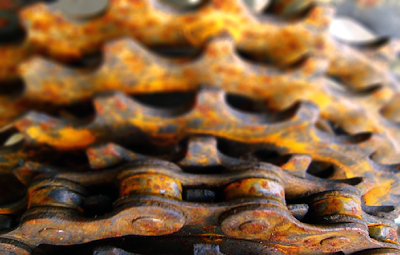 Use a bike chain lube to prevent your chain, cassette, and chain ring from growing rusty. An internet search can give you tips on technique, and the local bike shops can help you pick the right lube for your bike and wallet. Also, if you have exposed brake or gear cables, you will want to occasionally wipe them down with an old t-shirt or other cloth to remove dirt and salt, particularly if the weather has been nasty. You can treat cables to a light coating of either a dry-style lube (the ideal) or a very light wipe down with your chain lube (on the cheap) to prevent rusting. This lubrication advice can be applied to anything that looks like it could rust on your bicycle. Water and salt are some of the major ingredients involved in accelerating rust, so make sure to wipe down and lube the steel elements of your bike when the weather has been particularly wet and icy. Investing 5 minutes in rust prevention even just a few times a year can slow down rust destruction. The soft spots of your bike are prone to rotting in sunny or damp conditions. Your bike’s seat, tires, bar tape, or grips, will eventually disintegrate in UV Light. If you can’t keep your bike under some kind of roof, at least try to park it where it will get some shade and move it at least every few weeks, just so that a different part of the tire gets a chance to contact the ground. Covering your seat will protect it from the sun and also prevent it from being water logged in the rain. A plastic grocery bag, dollar store shower cap, or fancy bike seat cover will do the job equally well. If your bike gets soaked in a storm, park it somewhere sunny to dry out before algae or mold start to grow. On campus, there are a number of bike racks located under building overhangs or under covered shelters. Also, students should consider moving bikes inside while away from campus during winter break. If you are a seasonal student cyclist and don’t ride when the weather is cold, you might think about taking your bike home during the cold months. If your unused bike can hang out in your family’s garage or basement during the worst weather, it will be in better condition when you bring it back to campus in the spring. An outside bike will need an annual tune-up. You should either find a really skilled friend, or pick a local bike shop mechanic to check it out for you. A great time to schedule this is after the worst of winter is over with, so that you can maximize your riding in the warm months. Bikes are happiest when they are upright. When picking an outdoor spot to park your bicycle for more than a few hours, find a U-Rack, bollard, or similar style that allows your bicycle to stand upright with 2 points of contact. Wheel-bender style racks are abundant and okay for short term parking, but your bike is less likely to incur damage when parked at a U-Rack. If you don’t have a kickstand, make sure to tweak the angle of the front tire to ensure that your bike won’t fall down if it is jostled by an overzealous adjacent bicycle. Caution: rear derailleurs are particularly vulnerable to significant damage due to a poor parking situation. Because you can’t ride your bike if someone else has taken it for a spin, you’ll want to take steps to make sure it stays where you parked it. Most bikes are stolen because they are not locked at all. So, the easiest way to prevent theft is to lock your bike every time you park. Choosing the right lock for your bike is also a good idea. A determined thief can break any bike lock if he/she enough time and the proper tools; your goal in locking your bike is to make it difficult enough to deter the thieves without lots of time and a plethora of ungainly tools. A cheap lock made of thin cable or a flimsy looking U-style lock won’t deter someone who wants your bike. High-quality U-locks or thick high-security cables are probably a step in the right direction. Check out the opinions of others and weigh your attachment to your bike against the cost/convenience of a given lock to find one that you are comfortable using. Also, make sure you are using your lock properly, because locking your bike by the seat post is just as good as not locking your bike at all. Many bike thieves also want to take bikes that won’t be missed, keeping your tires inflated and bike in good condition will prevent guerrilla bicycle liberators from thinking your bike is neglected and in need of a loving home. 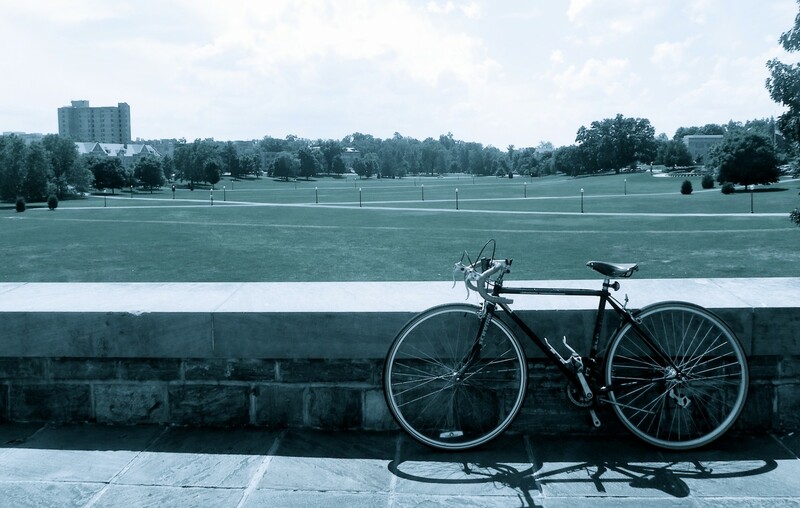 Virginia Tech bike registration is free, required, and a practically effortless tool for theft prevention and bike recovery. Campus cyclists are required to register their bikes. It is simple to do online, and owners of registered bikes can get better assistance in recovering stolen bicycles. Bonus: if you lose the key for your lock while your bike is parked on campus, Parking Services will assist by breaking your lock to retrieve your registered bicycle. Just because your bike has to live outside doesn’t mean it’s on the fast road to Rust Town. Taking a few steps to prevent rust, damage, and theft will let you enjoy your bike for years… maybe even long enough to finally get the room to move it inside.